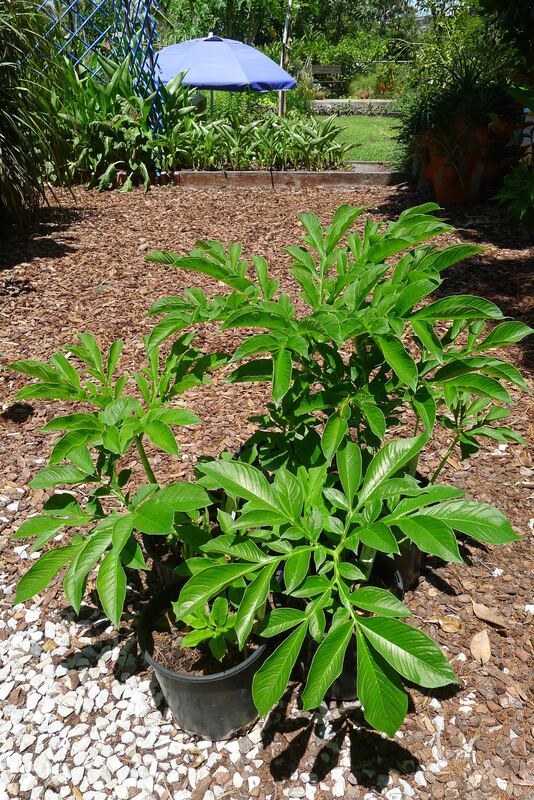 The gift that keeps on giving: In 2013, Annette McFarlane gave me a young Elephant Yam, Amorphophallus paeoniifolius. This tropical, forest-dwelling, winter herbaceous perennial root crop is native to India, SE Asia, Papua New Guinea and Australia. It is recorded as one of the first crops cultivated by indigenous Australians, so it is of high cultural significance. I propagated my tuber, splitting it into five, and I grew them in separate pots last summer. They have just sprouted to grow through our summer wet season – but each plant has sprouted suckers, so within a year my one plant has become thirty eight! Mature plants produce a single bloom in spring, which is then followed by a single leaf, and immature plants produce a single leaf. They erupt from the ground after the first soaking by summer storms, which this year was on 19th and the 26th November in my garden. It’s a noisy time of year – cicadas awaken and join the twenty four seven chorus of Channel-billed cuckoos and Pacific koels. Give them well composted, freely draining soil in a spot receiving 3-4 hours morning sunshine and water regularly with seaweed solution in dry weather. The cue to harvesting tubers in autumn is when the single leaf dies down. With care, the tubers can weigh several kilos each: think potato in a different wrapper. See cultivation notes from India here. Watch them being cultivated here. Discover Elephant Foot yam recipes here. 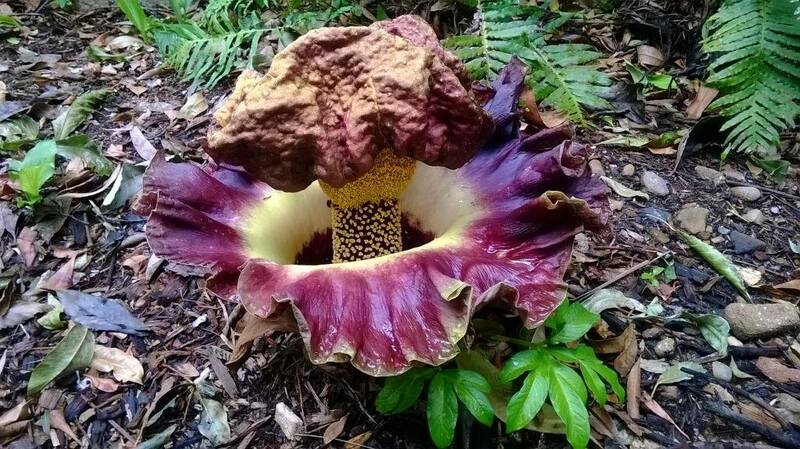 Elephant Foot yam is currently flowering at Roma Street Parklands, and the blooms won’t last long! ← Why Do Fresh Woodchip And Potting Mix Turn Mouldy And Repel Water? Hi Jerry I’m very interested in this plant. Do you know where I could obtain planting material? I may sell some at my next open day, but only if I have a surplus. No promises. I sell my surplus at my annual open day during mother’s day weekend which is advertised here and in my public Facebook profile.